When it comes to installing double hung windows in your home, look no further than Window World of Long Island. Whether you are looking to select windows for a new home, or you need to replace your current windows, double hung windows from Window World are a classic option that come in a variety of styles and sizes. All of our double hung windows are built for easy cleaning and maintenance, and are backed by our Limited Lifetime Warranty. Learn more below! Popular in homes of every style, Window World’s 4500 Series Double-Hung windows showcase style and value. The beautifully contoured design of the rugged vinyl frame blends with traditional to contemporary homes, and virtually all styles in between. Widely loved for their dual operable sash that tilt in for easy cleaning, Window World’s 4500 Series Double-Hung windows offer exceptional functionality. Made of premium vinyl that will never fade, and including features like vent latches and constant-force balance systems, these windows provide dependable performance, year after year. Multi-chambered vinyl profiles increase strength and thermal performance. Dual-paned 3/4″ insulated glass units are available with SolarZone™ glass. Glass penetrates sash 1/2″ to keep edges warmer. Frames and sash are welded at mitered corners for lifetime dependability. The sloped sill design prevents water from pooling during heavy rains. Multiple weather seals at various points around each sash reduce drafts. Closed-cell foam sill bulb reduces water infiltration. Window World’s 6500 Series Double Hung Windows are precisely engineered for superior energy savings. Built to last, our vinyl frame design replicates a wood appearance but is virtually maintenance free. With two operable sashes, Window World’s 6500 Series Double Hung Windows are cleaned easily from inside the home for the perfect combination of style and efficiency. Also, warm-edge technology is achieved efficiently from optimum-sized insulating glass units and a unique spacer design. 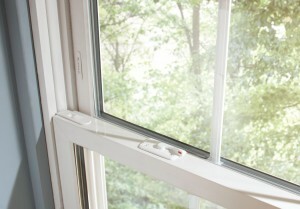 In addition, the 6500 Series windows are covered by Window World of Long Island’s impressive Lifetime Limited Warranty. Think double-hung windows could be right for your Long Island home? Contact us today for your free home estimate!